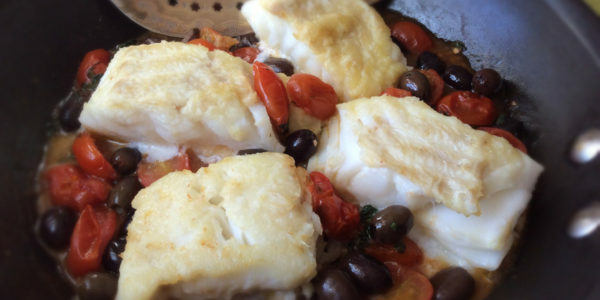 Cod Sorrentina style is a fresh second course, full of Mediterranean flavours and colours. This is a healthy and super quick recipe that you will cook many times…and it is also beautiful to see! 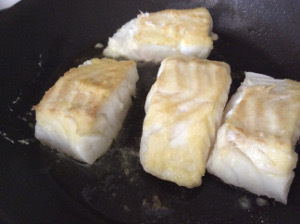 Cod 1 fillet of about 250 gr. Pitted black olives 30 gr. Extra virgin olive oil 25 gr. 1 nonstick pan, 1 knife, 1 chopping board, 1 dish, 1 spatula. 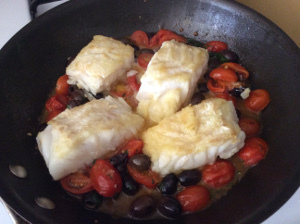 Chop cod into 4 chunks. Pour the flour in a dish and flour the fillet on both sides. 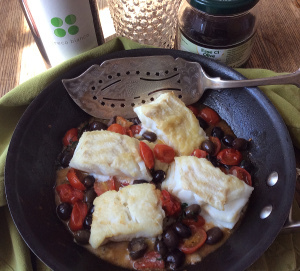 In a nonstick pan, heat the extra virgin olive oil, add the fish fillet and brown on both sides. 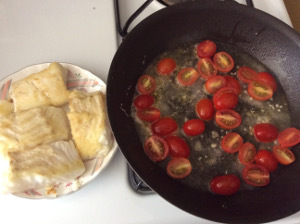 In the same pan where you cooked the cod, add a dash of oil and the chopped garlic clove. After a minute add the halved cherry tomatoes and olives. Cook for 10 minutes over low heat, stirring occasionally with a spatula. 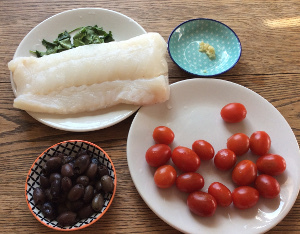 Place the cod fillet in the tomato sauce and olives you have previously prepared. 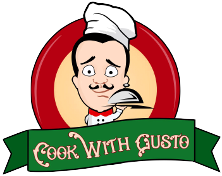 Cook for 5 minutes and finish by adding a few leaves of chopped parsley and oregano. Your Cod “Sorrentina style” is ready to be served and enjoyed. If you want, you can add a pinch of chilli pepper in the sauce, to give your dish a pleasant spicy accent. You can use a high-quality tomato sauce instead of cherry tomatoes. Use top quality olives. Their succulent and intense taste adds a unique touch to this simple dish. If you like you can use green olives instead of black ones.